We can not only add long-lasting beauty to your outdoor setting, but also add a touch of creativity to your backyard. 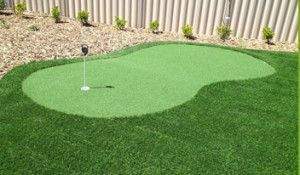 Made to our high standards, and designed to withstand the harshest of the Australian conditions, our putting green turf will turn you into a pro in no time at all. Designed to play as true as possible, without any bumps or seams, our catalogue of synthetic putting greens will be worth your investment. 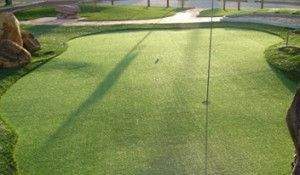 A straight and true outdoor putting green surface. A professional installation from experienced personnel. A realistic looking surface, that will be highly resistant to extreme weather conditions. A safe product that the entire family can enjoy. 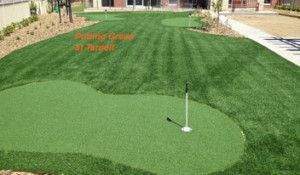 We can provide our putting greens for home only to the exact specifications that you need. Our expert installers have many courses under their belts, and will know exactly what to do to make sure that you’re receiving a high quality product. Not a fan of golf? We also provide many different types of sport field turf solutions, such as lawn bowls and tennis courts.